Astronomers have uncovered one of the biggest supermassive black holes, with the mass of 17 billion Suns, in an unlikely place: the centre of a galaxy that lies in a quiet backwater of the Universe. The observations, made with the NASA/ESA Hubble Space Telescope and the Gemini Telescope in Hawaii, indicate that these monster objects may be more common than once thought. The results of this study are released in the journal Nature. Until now, the biggest supermassive black holes — those having more than 10 billion times the mass of our Sun — have only been found at the cores of very large galaxies in the centres of massive galaxy clusters. Now, an international team of astronomers using the NASA/ESA Hubble Space Telescope has discovered a supersized black hole with a mass of 17 billion Suns in the centre of the rather isolated galaxy NGC 1600. 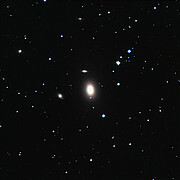 NGC 1600 is an elliptical galaxy which is located not in a cluster of galaxies, but in a small group of about twenty. 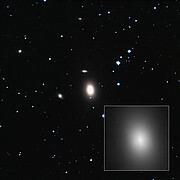 The group is located 200 million light-years away in the constellation Eridanus. While finding a gigantic supermassive black hole in a massive galaxy within a cluster of galaxies is to be expected, finding one in an average-sized galaxy group like the one surrounding NGC 1600 is much more surprising. “Even though we already had hints that the galaxy might host an extreme object in the centre, we were surprised that the black hole in NGC 1600 is ten times more massive than predicted by the mass of the galaxy,” explains lead author of the study Jens Thomas from the Max Planck-Institute for Extraterrestrial Physics, Germany. It is assumed that this black hole grew by merging with another supermassive black hole from another galaxy. It may then have continued to grow by gobbling up gas funneled to the core of the galaxy by further galaxy collisions. 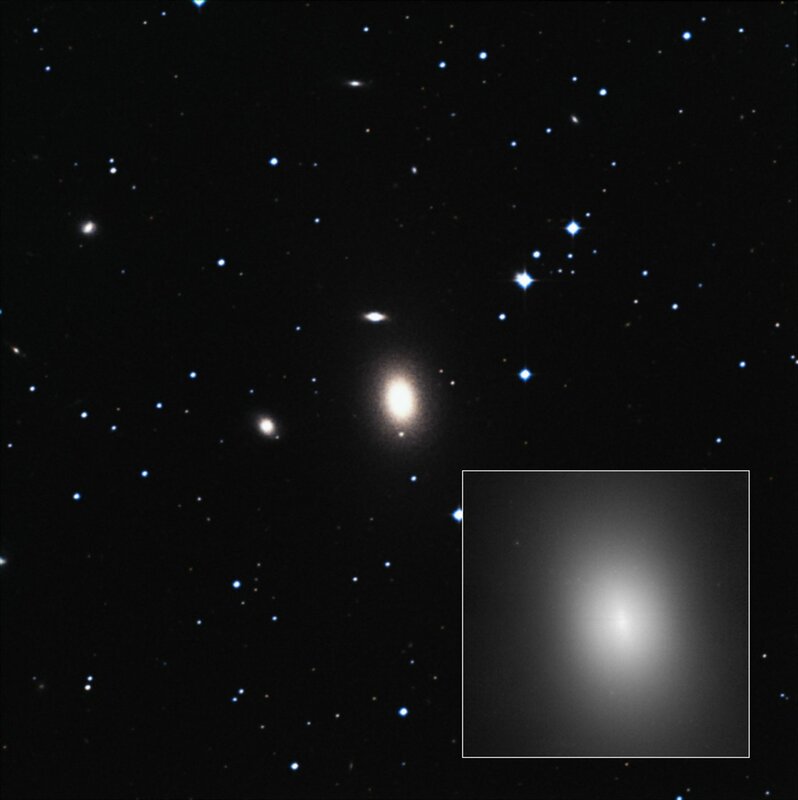 Thus may also explain why NGC 1600 resides in a sparsely populated region of the Universe and why it is at least three times brighter than its neighbours. As the supermassive black hole is currently dormant, astronomers were only able to find it and estimate its mass by measuring the velocities of stars close to it, using the Gemini North 8-metre telescope on Mauna Kea, Hawaii. Using these data the team discovered that stars lying about 3000 light-years from the core are moving as if there had been many more stars in the core in the distant past. This indicates that most of the stars in this region have been kicked out from the centre of the galaxy. The MASSIVE Survey, which began in 2014, measures the mass of stars, dark matter, and the central black hole of the 100 most massive, nearby galaxies, those larger than 300 billion solar masses and within 350 million light-years of Earth. 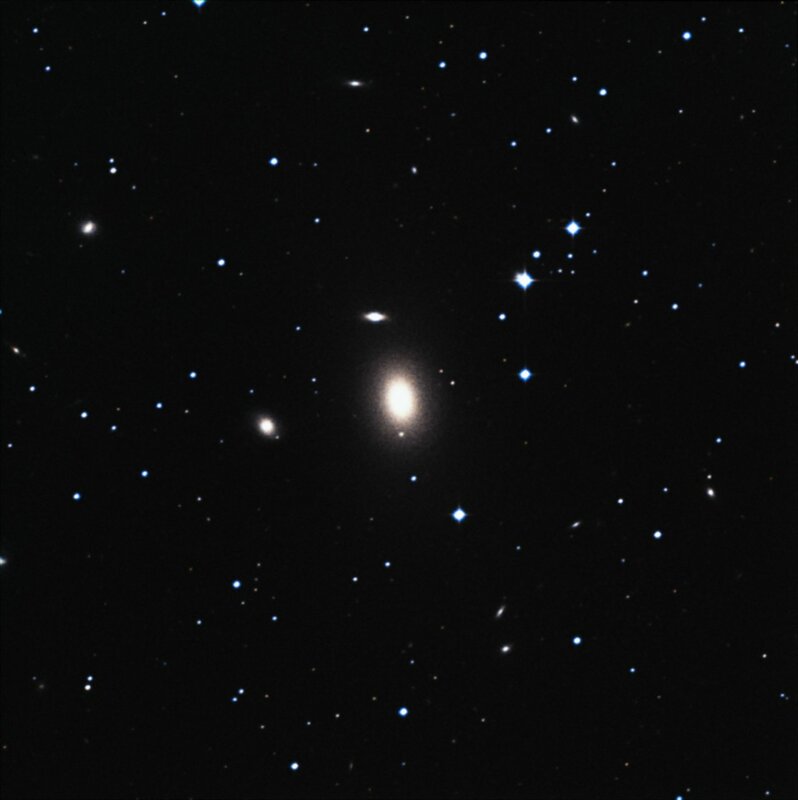 Among its goals are to find the descendants of luminous quasars that may be sleeping unsuspected in large nearby galaxies and to understand how galaxies form and grow supermassive black holes. The study “A 17-billion-solar-mass black hole in a group galaxy with a diffuse core” appeared in the journal Nature.